Published on May 17, 2010 in corruption, Elections, General T&T, NJAC, People's Partnership, PNM, Politics, Race and Identity and UNC. 6 Comments Tags: Jack Warner, Kamla Persad-Bissessar, Patrick Manning, Politics, Selwyn R. Cudjoe, T&T Govt, The People's Partnership. It is true in philosophy as it is in political science that if one asks the wrong question one is likely to get a wrong answer. Trapped in a climate of uncertainty, the question that faces the Trinidad and Tobago voter on May 24 is not whether the People’s Partnership (PP) can hold together if it is elected or whether Kamla is an inspirational genius? It is whether PP and Kamla who happen to be in the right place at the right time can fulfill their roles as creative place holders in our country’s political history. As I see it, the PP is simply an amalgam of individuals, parties and interests that have come together to get rid of the PNM. Their past histories have taught them (remember ONR in 1981 and COP in 2007) that if the opposition parties divide the votes they cannot defeat PNM. Coming together (and Kamla and Jack Warner must be credited for this achievement) gives them a better chance to defeat the PNM and that is their raison d’etre. It is irrelevant whether the PP possesses a common philosophy or how long they can stay together. The inchoateness of the present moment may just allow them to prevail in 2010. It is my contention that Trinidad and Tobago has reached or is about to enter another stage of its social development. Since the inception of elected representative government in 1925 the society has advanced through certain stages and thrown up leaders to meet the challenges which faced the society. Such changes have as much to do with the individual leaders as they have to do with the activities of people in their everyday lives at particular moments of their history. If we look at our history we will that Captain Cirpiani and the Trinidad Workingmen’s Association (TWA) were the most important players between 1920 and 1935. While Cipriani and the TWA made notable achievements (such age old pensions; a modicum of representative government; fortnight holidays for municipal workers) when more militant workers came onto the scene they were no longer relevant and gave way to another political force. Cipriani was followed by Uriah Butler who first came into the public eye when he led a hunger march in Port of Spain in 1935. The deteriorating conditions of the workers on the sugar estates and the oil fields (as a result of the depression) and a rising cost of living between 1935 and 1937 allowed Butler to rally dissatisfied workers to his cause. In 1936, he formed the British Empire Workers and Citizens Home Rule Party and led the oil disturbances in 1937 which inaugurated a new chapter of our history. The extension of the representative principle in 1945 threw up an interesting alliance between Butler and the East Indians. The elections of 1946 and 1950 respectively elevated Butler’s status. He banded with the East Indians to become one of the most prominent political leader of the period. Indeed, most of the elected members of his party were East Indians. Although Albert Gomes played a prominent role during the early part of the 1950s, Butler remained the most prominent leader during that period. Dr. Williams and the PNM entered the political arena in 1956. They ushered in a new political era that was characterized by the achievement of internal self-government and national independence. However, these notable achievements did not erase all the obstacles that stood in the way of the liberation of the underclass hence the onslaught of the Black Power movement in 1970. Like the nationalist struggle, it was part of a larger international current of freedom that was taking place throughout the world. This turmoil of the Black Power revolt was intensified by the oil boom of 1973 which tore the social fabric asunder. From then on the rise of financial capital (the age of “the blues”) depreciated the social capital we had developed over the previous century. From 1973 to 2010 we witnessed the declining importance of our village councils; our friendly societies; our Boy Scout movement; our garden clubs and other such social organizations. Although we had more money the quality of our social relations declined considerable. The death of Eric Williams in 1981 coincided with an end of the hegemony of the PNM and de-centered the nationalist movement. After the defeat of the PNM in 1986 (it had lost the Federal Elections in 1958) national governments changed five times, an indication of the fragmentary and unsettled nature of the society and the crying need for something new. Although Vision 2020 tried to fill the gap its inability to center on people rather than things (big buildings, etc) diffused the post-nationalist movement further. Today the society is at a cross roads. 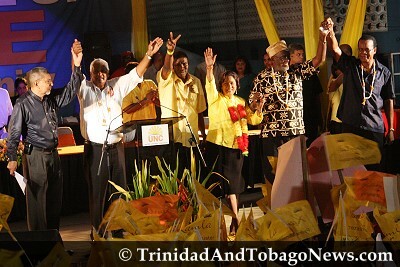 Although the PNM has lost its way the PP has not offered anything different. It seems to be in a competition with the PNM to see who can offer the society more things (such as $100 m. Life fund; a raise in old age pensions; free laptops to all SEA students, etc.,) rather than demand that our citizens contribute more of their spiritual and creative gifts to the society. In this interregnum, citizens should think more about the collectivity rather than the self trying and use their creative abilities to move the society forward. No one can guarantee that we will be better off if the PP triumphs. It might be the impetus that we need to move towards the creation of a truly interracial society or one might just see the intensification of ethnic chauvinism. However, the challenge is not so much if the PP stays together -they might well do that for the next five years-but what sort of social environment they create during their rule. 3rd paragraph from last, ‘labtop’ should be ‘laptop’. I only mention that because that was the dull thud of the other shoe dropping… precisely where it needed to. While I am not a political or social academician or scholar, I am inclined to agree with Dr. Cudjoe in his assessment of our present position in the political evolution of our country. A nation like all living things, has a recognisable growth process – it is conceived, it is born, and then proceeds to grow, and at certain points in its growth , it is marked by certain “rights of passage” as it were. Not to belabour the analogy, but we are all aware of the “dread” teenage stage, from which more often than not, emerges a responsible young adult – much to our relief and sometimes, surprise. And so, I agree that as a people, we have arrived at that juncture where “our social development /political power must be placed in the hands of the people in their communities”. And if, as with the individual, we decide that marriage is part of that growth process, let us go on and celebrate the political union of the “coalition”, understanding that while there is no guarantee that “it will last” (just as in individual marriages!) it may be a necessary and indeed, healthy and welcome stage in our development, possibly sowing the seeds of a truly democratic and balanced society, with ethics and values which are acceptable to all. Maybe the Prof. can tell who was the Minister of Education responsible for this ‘prize possession of the UNC’. If you go down to Brechin Castle, just behind the Brechin Castle Sugar Factory on Bagasse Road, you will find a very austere Blue and Cream building, nestled softly within the gentle plains of Caroni and surrounded by verdant sugar cane plants. This building is known as the Trinidad and Tobago Institute of Technology. If you look a little closer, you will see several young men and women bustling feverishly about the campus preparing, it seems, for a new semester. Built to function along the lines of a Corporate University, this Institute boast of having the state of arts equipment for its students, argues that it is driven by what it calls strong hands-on skills and provides its students with a university -related curricular. In their Calendar of 2002-2003, the institute says it was established to produce “a cadre of Engineering Technologists to meet the needs of the middle and upper levels of industry.” Unfortunately, when this Institute was envisaged, little thought was given to the inclusion of Africans in the society. So intent was the UNC to take care of its own, little thought was given to including Africans in this Institute. It was the prize possession of the UNC; the golden jewel in its educational crown to maximize East Indian advantage at the expense of all else in the society. Maybe Cudjoe and his erstwhile foes in the UNC have BOTH come to the realisation that you can’t judge a man or woman solely by the colour of their skin, etc. That was then. This is now. The world changes and so do we. Cudjoe got to know Patrick Manning and the PNM hierarchy much better over the last decade. Likewise, George, try as you and others might, you cyar just dismiss the political earthquake that was the defeat of Basdeo Panday. His defeat shook the country to its roots – even if it didn’t seem so at the time. We are all still feeling (and Manning reeling from) the repercussions. In some ways, it really is like Obama’s election. Obama’s election did not change America; it reflected a society that had already changed. Likewise with Trinidad and Tobago. Kamla will win a comfortable majority and become Prime Minister of Trinidad and Tobago because the society has already changed. Some of allyuh need to crawl out from under the rock where you living and come into the sunshine. I know it can be scary but it’s very liberating. Even in the days of slavery, after the announcement of emancipation, there were some who were frightened to leave the plantation. No need to get so defensive Herbsman, I just asked one single question. Ok, let me rephrase the question. What was Minister of Education Kamla Persad-Bissessar’s role in this school? Herbs, yuh might want to take the opportunity to study Slavery in T&T before you make such uninformed statements about ex-slaves and emancipation. To all those people who choose not to vote, or vote by party, are not only hurting themselves but the entire country. The better party may not get your support but come what may a government will be selected. By with-holding your vote for the better party, you think you are sending the parties a message that there are still a lot of uninterested or undecided voters and much more need to be done by the parties to get their votes. Well the parties will see it differently, and that is, a certain part of the population do not care what government they get, because they will vote for us till-de-die, or by choosing not to vote, and for this reason the government lower their standards and performance to match the population perceived interest in the government. So if more of the population voted for the better candidate, and not for party, the government will feel as though they are being watched by more of the voters and hence will have to up their standards and performance. Their chance of being re-elected will rest solely on their performance and not on till-ah-die supporters. Let’s say for e.g. we have a 30% turnout and party A won the election. What kind of mandate is that? Do you think party A on forming the government will rule with any commitment? For them, if the people don’t care to vote, I will not care to rule, and what is happening now is just that. They know most of the support is from till-ah-die voters, so they can do whatever they want. Party A can do whatever they think, because there support base is there till-de-die. So do you think party A need to work for votes. No they can drain the treasury and can still get the till-ah-die votes. If we give party A a strong mandate to rule then on forming the government they know that the people is in control and if they don’t perform come next time would be voted out. So I think by voting for party or choosing not to vote is a grave mistake and a big part of the reason as to why the governing of the country is in such a mess. If you don’t care to vote smart, they will not care to rule smart, simply put.